This section goes into quite a bit of detail on how I built my rotating disc television. Please note that I'm not responsible if you do or copy anything I describe and something goes wrong! In 1884 Paul Nipkow (pronounced Nipkov) thought up and patented the idea of scanning an image and sequentially transmitting the brightness information. At any one time only the brightness of a single point on the image is being transmitted, which is easy over a single channel (e.g. pair of wires or a single radio frequency). Provided this point moves around the whole image in a specified pattern the received signal can be used to recreate the transmitted picture. If this is repeated many times per second the person watching the received images will see smooth movement. This is because the eye cannot work quickly enough to identify the successive images as being individual pictures, an effect known as persistence of vision, so the brain interprets changes from one image to the next as normal motion. 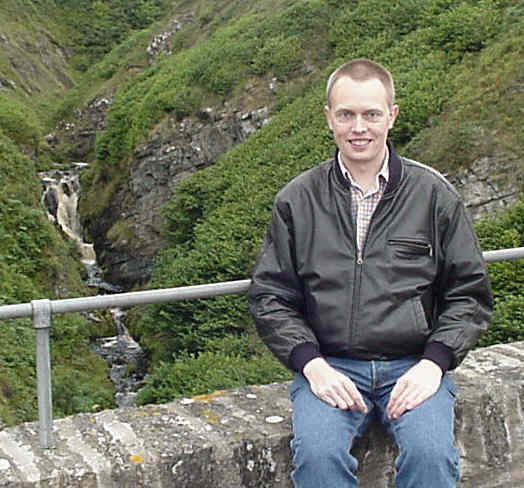 The pattern traced out by the point measuring the brightness moving around the image is somewhat arbitrary provided all points in the image are visited and could even be changed from one transmitted image to the next. The same pattern traced out at the receiver with the corresponding brightness at each point will reproduce the picture. In practice most mechanical and electronic systems work best by scanning the same pattern every time in a rectangular format sampling the brightness along adjacent parallel stripes laid out across the rectangular region one stripe at a time. This results in the familiar television rastor where the image appears to me made up of lots of close together straight lines. 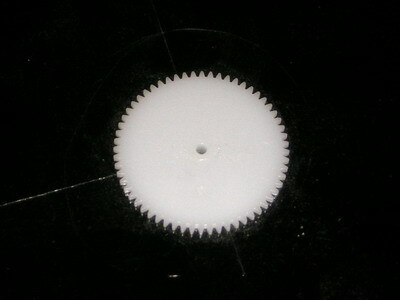 The nipkow disc scans successive lines by rotating a spiral of holes, each hole slightly further in towards the centre of the disc. A typical disc to display images may be about 30cm in diameter with 32 holes in a spiral (angle between successive holes being 11.25 degrees). The holes do not spiral in very rapidly, the outermost being at a distance of about 146mm and the innermost about 126mm from the centre of the disc. With holes about 0.6mm diameter the lines drawn out as each successive hole passes by will almost, but not quite appear to touch each other. A disc with these dimensions will give a picture approximately 2cm by 3cm. 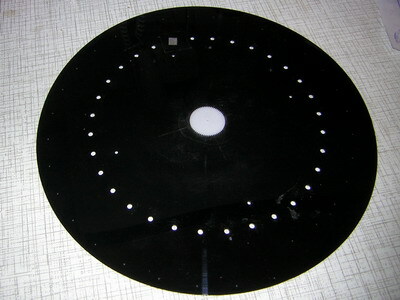 The same disc can be used in a camera but its ability to capture sufficient light through the small holes is limited and various modifications are possible to improve on this. The picture shows a Nipkow disc I have used. The circle of larger holes used for synchronisation are clearly visible, the scanning holes are much smaller and hard to see. Place the mouse cursor on the picture to see a contrast stretched picture of the disc which makes the spiral of scanning holes much easier to see. Here are some interesting points to note about Nipkow discs used to display images. 1. The picture is small compared to the size of the disc. Making the disc larger will address this problem but rotating it at a speed of 750rpm becomes more difficult requiring a more powerful motor and a greater possibility of instability if unbalanced. Large spinning discs can be very dangerous if they come off their mounting, Baird discovered this while experimenting! Smaller discs are possible but require very tiny scanning holes which need a very bright light source and the picture is really too small for normal viewing. A magnifying lens is often used to make the picture appear larger. 2. The material the disc is made of is important. It must not deform significantly while spinning and not be so flexible that it wobbles around excessively as it gains speed. To some extent spinning the disc makes it more rigid. The material must be easy to cut and drill with precision and be thin, ideally thinner than the diameter of the scanning holes - really a rather demanding set of requirements! 12" records were a firm favourite at one time. The NBTV club have supplied discs made from sheets of 2mm thick Darvic (a type of plastic in sheet form which has many of the desirable properties) and these are the ones I've used for my experiments (see above). Unfortunately they may not be currently available. The best discs I have seen operating are made from stainless steel but this is an expensive option. Some people have experimented using photographic film, basically photographing a picture of the required scanning holes. This approach appears to have a number of advantages but there are a number of technical problems which make it difficult to obtain good results in practice. 3. When mounting the disc on a motor or bearing it is important that the centre of the disc (relative to the spiral) is aligned with the central axis of rotation, otherwise the picture displayed will be distorted. This is difficult to achieve unless some careful planning goes into the way the disc will be mounted on the spindle and the positioning of the scanning holes relative to this. The Darvic discs from the NBTV club came with a nylon gear wheel attached to the centre which is a friction fit on the 2mm spindle of a cassette recorder motor. I assume the gear wheel was attached first and then the disc rotated on a 2mm spindle while the scanning holes were drilled, ensuring their correct positioning. 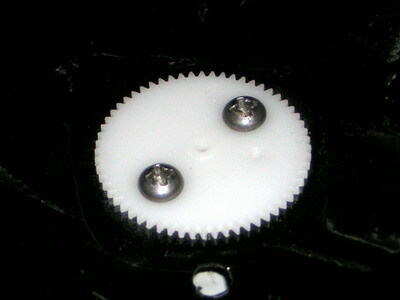 Place the mouse cursor on the picture to see the other side of the gearwheel which is threaded and secured by a nut. 4. If the nut cannot be tightened sufficiently to stop the disc moving around the gear wheel drilling two holes and adding two small nuts and bolts can provide a solution. 6. In the first picture above you can see one of the synchronisation holes is covered with tape. This may help lock the picture in the correct position since it corresponds to the missing sync pulse in the NBTV club synchronisation standard. 7. The Nipkow disc produces an image which is not quite rectangular because each scanning hole is following a circular path. The picture reproduced is not distorted if a similar scanning disc is used in the camera. 8. If the disc is not truly circular relative to the axis of rotation or significant material has been removed it may not be balanced and vibrate when rotating at speed. This could be dangerous and will degrade the picture so it may be appropriate to balance the disc. This can be done with the disc vertical without running the motor by slowly rotating the disc by hand and determining which side seems heavy, preferring to be at the bottom. Then by removing disc material (perhaps with a drill) or adding weights (which must be attached so they will not fly off) at suitable positions this can be counteracted and the disc balanced. This is not a trivial task and fortunately I have not needed to do this with my discs. 9. After the holes are drilled being so small they may be difficult to clear of all debris. A fine wire poked through them is probably the best bet. Great care should be taken not to do anything to the holes to change their size since this will almost certainly make them random sizes allowing different amounts of light through them which exaggerates the line structure on the final image. 10. The scanning holes are usually made circular because these can be made fairly accurately using a small drill bit. There is a strong argument for making the holes square since this allows extra light through and more uniformity across the line profile. However these are more difficult to make accurately and usually requires a metal disk and a square punch (perhaps one with the sides filed flat). Not recommended for a beginner. 11. A 12" disc has a lot of mass associated with it and air resistance when turning. Some regions of the disc can be cut away to help minimise these effects essentially producing a disc with wide spokes. Depending on the material used it is important to avoid cutting so much away that it loses its mechanical rigidity. 12. Making your own disc is not a trivial task and takes a lot of time and care. If you are good at making models you probably have the right skills and equipment for making a Nipkow disc. The rest of us just have to struggle or buy a ready made one. 13. Although it is common to attach a Nipkow disc directly to a dc motor better performance may be obtained by mounting the disc on a separate bearing and using a rubber drive belt between pulley wheels attached to the motor and disc. By having a smaller pulley on the motor it can run closer to its optimum speed (typically around 3000 rpm) which will increase the power available to turn the disc. A popular (and low cost) precision bearing used in this arrangement is the drum head out of a discarded video recorder. 14. Many constructors attach a stroboscopic disc with a total of eight black and eight white segments since this appears to stand still when the rotational speed is correct viewed under mains lighting (with 50Hz mains and 750 rpm). It doesn't have to be particularly large but it needs to be centred on the axis of rotation. I plan to add sections about synchronisation, construction and operation at a later time.